Platform TI DM368 SoC CPU; 128MB Flash; 256MB RAM and Linux 2.6 Embedded O.S. Chipset 1/2.5" 5-Megapixels (2592×1920) progressive CMOS sensor. SNMP, RTSP, RTP/RTCP, Bonjour, PPPoE, QoS, UPnP, Multicast. Clamping Voltage: 10V @ Ipp= 5A. /8.4KA(2 Times) @8/20μs (1 Time); Insulation Resistance:ĄŲ10000MΩ. 802.1X port-based authentication for network protection. Event notification Event notification using FTP, SMTP, Samba server or Alarm output triggered. QuickTime plug-in for MPEG4/H.264), Google Chrome v30 or above. Resolution: Main Stream 2592×1920, 2048×1536, 1920×1080, 1280×720. Resolution: Sub Stream 320×288, 320×240. Mode and frame rate can be adjustable. Streaming H.264/MPEG 4/MJPEG/3GPP multi video stream. AES/AWB/AGC/BLC support, and Auto/DC-Drive IRIS. Color 0.5 Lux /F1.2 B/W: 0 Lux (When IR LED on). Overlay Text / Time Stamp / Watermark overlay on video clips. Micro SD/SDHC for on board storage*; RJ-45 (Green/orange LED indicates linking status). Lens f=3.6mm/ F1.8, or f=3~9mm/F1.2~F2.3. Field of View f=3.6mm 75.33°(horizontal)62.25°(vertical). IR Cut Built in removable IR-cut filter for day & night function. IR Illuminatorst 30pieces 14µ LED, Effective up to 20 meters. configuration file; Upload data to FTP/SMTP/Samba Server. 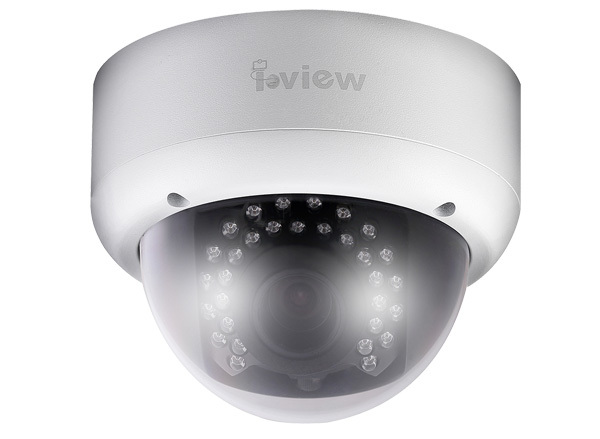 Housing Vandal-proof IK10-rated Aluminum housing, IP66 waterproof. Dimension/Weight Ø 156mm x 128 mm (H) / 1.08Kg. Temperature -20°C ~ 50°C; Humidity 20% ~ 80% RH. Accessories Support Wall mount & Ceiling mount Bracket (Optional). Approvals CE, FCC, RoHS, IK10, IP66. * Only available on Full Function.